Hrothgar, We Have A Problem...What do you get when you combine the Abbasid caliphate, Vikings, and lazy film making? No, that wasn’t my lame attempt at humor, but that is the general plot behind The 13th Warrior, starring Antonio Banderas. The movie itself is based on the novel Eaters of the Dead, by Michael Crichton, who adapted the Old English poem Beowulf and the Arabic account Risala. The events have a very loose basis in historical fact, so if you’re watching the movie in search of historical accuracy, don’t, because you won’t find much here. The movie was directed by John McTiernan, best known for smash hits like Predator, Die Hard, and The Hunt for Red October. With a director with such an impressive CV at the helm, many did seem to highly anticipate the release of The 13th Warrior. Boasting an $85 million budget, all the pieces were in place for The 13th Warrior to impress. Which it definitely didn’t do. The movie was a flop by all accounts, grossing only $61.7 million against its budget. Critics tore into the movie as well, with movie critics citing the shallow plot, ineffective acting, and all around lazy filmmaking as to why it fell flat. The movie draws much of its historical basis from Beowulf and the account of Ahmad ibn Fadlan, who is based off of the historical figure of the same name. Ahmad ibn Fadlan was a tenth-century dignitary from the Abbasid Caliphate sent to the Volga River settlements to guide the recent converts to Islam in religious and spiritual matters. However, in The 13th Warrior, we instead find Ahmad Ibn Fadlan’s character as a disgraced tenth century court poet who was exiled to the Volga River as a punishment for his involvement with the wife of a nobleman. Ahmad Ibn Fadlan then finds himself forced into an expedition to battle the evil monster Wendol which is threatening the Volga Bulgurs. Much of the story dynamic draws upon Beowulf. In The 13th Warrior, we meet Volga Bulgur king Buliwyf (Beowulf, Buliwyf, close enough?) who is based off of Beowulf’s character. Buliwyf leads his people in the battle against the evil entity Wendol, much like how Beowulf leads his people against the ancient evil Grendol. Both characters meet their fate at the end of their respective stories, with Buliwyf succumbing to wounds he suffered in the fight against Wendol, and Beowulf dying from wounds suffered while fighting a dragon. There were a few significant historical inaccuracies that stood out to me immediately. First and foremost, the opening scene of the movie which supposedly shows the journey of Ahmad ibn Fadlan from Baghdad to the Volga River…except it places modern day Baghdad somewhere between the Caspian and Black Sea, about 700 miles north of its actual location. Okay maybe geography wasn’t John McTiernan’s strong suit, that’s understandable, many people struggle with general geography. But even lazier than this goof were the characters wearing a hodge podge of armor which didn’t exist at the time. During one scene, we even see a character wearing a full metal steel breastplate, which wouldn’t exist for another few centuries. Then we also have the confusing prayer scene in which Ahmad Ibn Fadlan, the character played by Antonio Banderas, combines Muslim and Christian traditions in his prayer before battle. The scene itself wouldn’t be so bad if Ibn Fadlan’s character’s prayer wasn’t directly blasphemous in the Islamic tradition, but hey we came to be entertained, not schooled in the ways of Islamic prayer. To say that the movie was a complete flop is a bit harsh though. Without The 13th Warrior, we wouldn’t have seen Antonio Banderas’s knack for linguistics, where he picks up the language of the Vikings in the span of a few hours. I wish I was kidding. But ridiculousness aside, the movie was actually pretty entertaining. I felt like I was thoroughly engaged for the entire length of the movie. As long as you watch the movie with tempered expectations, leaving historical accuracy at the door, you might actually find yourself cheering on Antonio Banderas and the Volga Bulgurs against Wendol, like I did. 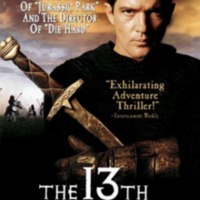 Tariq Rasuli, “The 13th Warrior (1999),” Medieval Hollywood, accessed April 19, 2019, http://medievalhollywood.ace.fordham.edu/items/show/14.